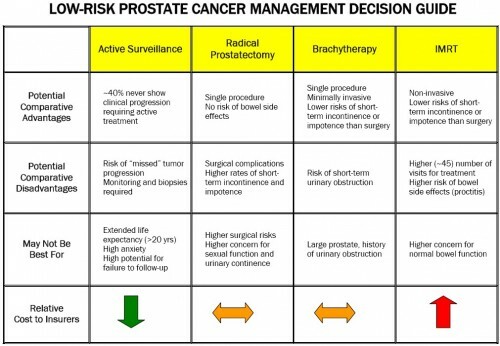 The lower cancer detection rates linked to self-referring urologists suggest that financial incentives prompt those urologists to perform prostate biopsies on marginal cases. Thus, self-referral of prostate surgical pathology services leads to increased use and higher Medicare spending, but lower cancer detection rates. In a cross-sectional study of prostate cancer patients from 2004 to 2005, we found that regions with lower rates of inappropriate imaging also had lower rates of appropriate imaging. Similarly, regions with higher overall imaging rates tended to have not only higher rates of inappropriate imaging, but also higher rates of appropriate imaging. 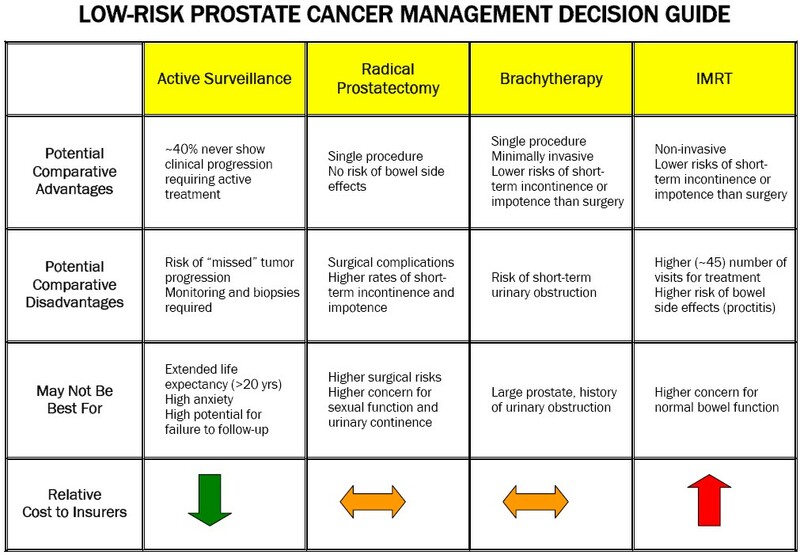 In fact, men with high-risk prostate cancer were more likely to receive appropriate imaging if they resided in areas with higher rates of inappropriate imaging. We found that in the early period of IMRT adoption (2001–03) men with high-risk disease were more likely to receive IMRT, whereas after IMRT’s initial dissemination (2004–07) men with low-risk disease had fairly similar likelihoods of receiving IMRT as men with high-risk disease. This raises concerns about overtreatment, as well as considerable health care costs, because treatment with IMRT costs $15,000–$20,000 more than other standard therapies. In a survey of 400 men who had open prostatectomy or robotic prostatectomy, 24 percent of those who had robotic prostatectomy expressed regret with their treatment choice, while only about 15 percent who had open prostatectomy expressed similar regret. Sigh. Let’s put all that in or near the “bad” category. No surprise here, really. And it clearly is not all bad. Many who received these services (biopsies, imaging, radiation treatment, robotic prostatectomy) benefited or feel they did. Yet, there is tremendous room for efficiency gain in our health system, corresponding to appropriate application of comparative effectiveness evidence and shared decision making. Naturally, many well-meaning policy initiatives toward this end might cause too abrupt a disruption and loss of income for certain types of providers, which is the source of resistance to them. So, why not pay for efficiency and use of evidence and consumer-involvement and penalize in cases of lack of application of them? It may cost something (or save less than blunt cuts, which are politically challenged anyway), but at least we’d be getting something for our money. So, what about “ugly?” Look no further than the Wall Street Journal. Bill Gardner provides a counterpoint. I hope this isn’t too off-topic, but this is why I wish the math departments in the U.S. School systems focused less on Calculus and more on Statistics. I happen to be an engineer, and actually do use some calc. Everyone could benefit from some knowledge about how probabilities work. Instances like these only highlight that. Medical tests are wonderful, and when they accurately identify a disease in its early stages… Huzzah!. However, when you have a test in which the false positive rate is high, people need to really understand what that means.